Free land! In 1862, Congress passed a law called the Homestead Act that gave 160 acres of land to any citizen or intended citizen who could pay a ten-dollar filing fee, live on the property for five years, and make improvements on it. Building a house and farm on the western frontier was hard work. But a Homestead claim was the chance of a lifetime. In the decades that followed, hundreds of thousands took the federal government up on its offer to homestead on lands in the West. Indeed, the Homestead Act of 1862 became the greatest land giveaway in American history. The person who presided over passage of the law was Pennsylvania Congressman Galusha Grow. 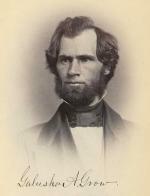 Pennsylvania Congressman Galusha Grow, 1859. Galusha Aaron Grow was born in Connecticut on August 21, 1823. In May 1834, his widowed mother moved her family to Susquehanna County, Pennsylvania where she and her six children lived and worked on a 400-acre farm and later operated a lumber business. After attending schools locally, and in Philadelphia, Grow graduated from Amherst College in Massachusetts, then studied law. Admitted to the bar in 1847, he joined the law office of United States Congressman David Wilmot in Towanda, Pennsylvania. When Wilmot withdrew as a candidate for reelection to the House of Representatives in 1850, he nominated his young law partner to run in his place. Then only twenty-six, Grow won the election and took his seat in Congress in December 1851. As a congressman, Grow was a persistent advocate for the interests of frontier families and repeatedly offered legislation to open public lands for settlement. In 1856, Grow broke ranks with his party over the expansion of slavery and joined the newly formed Republican Party. In Washington, Grow joined other northern congressman who supported new federal land grant legislation to accelerate the settlement of the American West. Homestead legislation fulfilled many of their national objectives. The offer of free land in the West provided a safety valve for the surplus of poor and discontented workers who crowded the nation's northern cities; it would cement control of vast stretches of the continent still under control of Native Americans who had never acknowledged American sovereignty and tap the vast wealth of the continent's endless natural resources - its timber, ores, soils, and precious metals; and it would tip the balance of political power against the slave South. The Cornell Farm, by Edward Hicks, 1848. In the 1850s, northern free soilers and pros-slavery settlers from the South were battling, often violently, for political control of "bloody Kansas" and other territories that would be admitted as either slave states or free states. The balance of political power in Washington hinged upon who would win these battles. Again and again, anti-slavery forces attempted unsuccessfully to pass homestead legislation that would flood the West with independent family farmers from Europe and the northern states. Southern congressman opposed it with equal vehemence. The outbreak of the Civil War broke that stalemate. After the southern congressmen walked out in 1861, Republicans and Free Soil Democrats saw their chance to push through their Homestead Act before the expected return of the renegade legislators from the South. To lead the newly elected Congress, the House of Representatives elected Galusha Grow as the new Speaker of the House. Speaker Grow saw to it that his Homestead Act came to a vote. Congress approved the bill on May 20, 1862, and President Lincoln signed it into law seven days later. In July, Lincoln also signed into law the Morrill Land Grant Act, which endowed agricultural and mechanical colleges in each state through the sale of over thirteen million acres. Many of the more than seventy "land grant" colleges established under the Act, including the Agricultural College of Pennsylvania (today's Pennsylvania State University), would become large public universities that have educated millions of Americans who might not otherwise have been able to afford a college education. The Homestead Act unleashed a mass migration, as more than ten million people poured onto Indian lands in the American West between 1870 and 1890. In just fourteen years the annual wheat tillage rose from 152 million to more than 499 million acres. In thirty short years American farmers, whose numbers nearly tripled, put more acres under the plow than they had in the previous 250 years. Like Thomas Jefferson and George Washington before him, Galusha Grow envisioned America as a nation of independent family farmers - a vision for Grow based on the prosperous, tidy farms of the Pennsylvania countryside. What worked in Pennsylvania and elsewhere in the East, however, that did not work well in the treeless, semiarid plains of the American West. By 1900 more than 600,000 claims had been filed for more than 80 million acres, but of these only one-tenth went to legitimate homesteaders. The initial flood of homesteaders took place during a period of unusually wet and mild weather. When the weather turned bad in the 1880s, tens of thousands of homesteaders lost their claims. As thousands of Kansas farmers went broke and fell into tenancy or left the state altogether, the joke spread that "the government bet 160 acres against your $10 that you would starve to death before you could live five years on the land." Land speculators bought up millions of acres. Disregarding the land rights of Native Americans, the federal government gave away more than 131 million prime acres to American railroad corporations and millions more to timber and mining companies. After passage of the Homestead Act, Galusha Grow ran afoul of Republican leaders in Pennsylvania and lost his bid for reelection in 1863. After serving as president of the Houston and Great Northern Railroad from 1871 to 1876, he returned to Pennsylvania and worked with coal, lumbering, and oil companies. 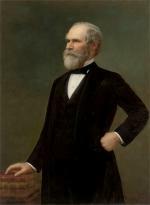 In 1894, he returned to the House of Representatives to fill a vacancy brought about by the death of William Lilly, and then served three more terms. Galusha Grow died at his home in Glenwood, Pennsylvania, on March 31, 1907. James T. DuBois and Gertrude S. Mathews, Galusha A. Grow: Father of the Homestead Law (Boston: Houghton Mifflin Company), 1917. Eric Foner, Free Soil, Free Labor, Free Men: The Ideology of the Republican Party Before the Civil War (New York: Oxford University Press), 1997.